It's definitely that time of year again - there's a distinct chill in the air, it's getting dark earlier and the shops are filled with oranges, greens and blacks - offering you your opportunity to dress as a witch, wizard or goblin. I love that pumpkins make much more of an appearance in the shops now, a short time spent in America as a child mean I have memories of those very traditional Halloween celebrations. There are photos of me and my sister, hand in hand in our nurse and cookie monster costumes. And no, you don't get to see them. I've not tried my hand at pumpkin carving - I'm not entirely sure my knife skills are anywhere near good enough to create the kind of result that I want in my head. So, I'm going to stick with baking. 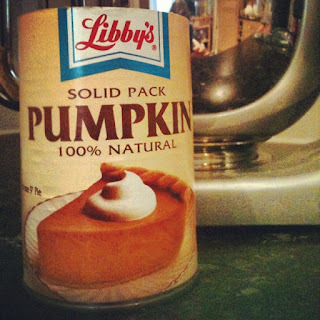 I'd bought a pumpkin to roast and use for this recipe that I've been thinking bout for a while. My plan was to split and roast it, then scoop out the warm insides - but then... I found pumpkin puree in Waitrose! Hurrah! Quick and easy and now I can add pumpkin and ginger soup to next weekends cooking. I'd a pumpkin traybakes with a cream cheese frosting on Pinterest. I wanted to make it slightly more British so decided to use an idea from an old Delia book and layer the sponge with raw, finely sliced Bramley apples. In the Delia book it's plums layered in flapjack mix but I wanted to try it with the pumpkin sponge. I was worried it would be too wet, so cooked it for an extra 10 minutes from what I thought, and then left it to cool in the hot tin. This is a beautifully soft sponge, the tartness of the apples cutting through the sweet, slightly moist cake. The top has a little crunch from the sugar - I might switch this out for a more granulated brown sugar to add some flavour as well as texture. I've cut this into slices rather than squares, and that gives you 16, but you could easily make it into squares and double that. I will have to try this recipe for Halloween bake! I love the combination, sound great! Great find in Waitrose. I won't think they will sell this puree! It will be so easy to use this than making your own from craving the pumpkin! His sound delicious, apple and pumpkin are a great combination!